Preheat a grill or grill pan to medium-low heat. In a bowl, mash together goat cheese, artichokes, pimientos, oregano and green onions. Spread evenly on one side of each slice of bread. Arrange on the grates and cover (with the grill lid, or an upturned skillet, if using a grill pan). Grill until bread is deeply browned on the bottom and cheese is warm, about 5 minutes. 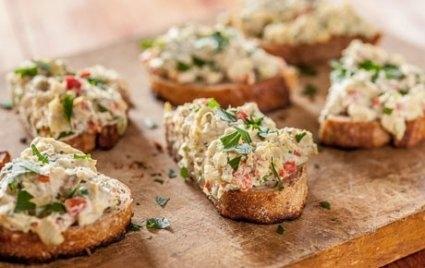 Top with parsley and serve. Per Serving: Serving size: 1 toastie, 210 calories (70 from fat), 8g total fat, 4g saturated fat, 10mg cholesterol, 460mg sodium, 27g carbohydrates, (4 g dietary fiber, 4g sugar), 11g protein.